TREDISEC is designed and structured from its conception to accomplish and satisfy the mission and objectives described in About Tredisec. To this end, the work plan is organised in 7 work packages, whose interdependencies and relations are depicted in the following figure. WP2 will describe the use cases as well as their technological and business context, in order to elicit a set of requirements that will underlie the TREDISEC architectural model. These requirements will act also as the internal clock of the project, synchronizing the research and development activities of WP3 – WP6. WP3 – WP5 will conduct innovative research that spans the whole architecture of the project and will implement the security mechanisms, services and components that permit integrating security&trust aspects within the currently deployed cloud ecosystems. WP6 will implement the TREDISEC framework, enabling the services and components developed in WP3, WP4 and WP5 to seamlessly work together. 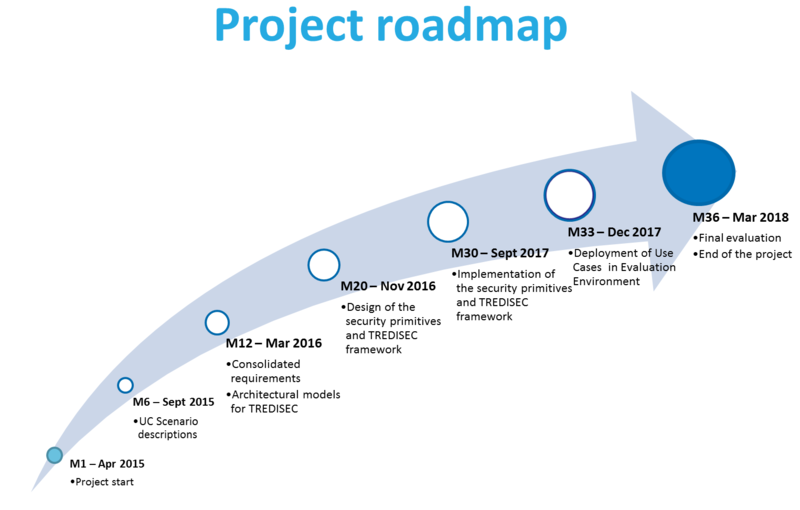 The required coordination between the results of WP3 – WP5 and the integration work in WP6 will be achieved through three major Milestones: at M20 with the design of the primitives, at M30 with the implementation of the primitives and the unified framework and at M33 with the deployment of them into the use cases evaluation environment. WP6 also envisages deploying the TREDISEC framework within test cloud environments which will, provide the necessary support for the evaluation of TREDISEC in the real use cases. 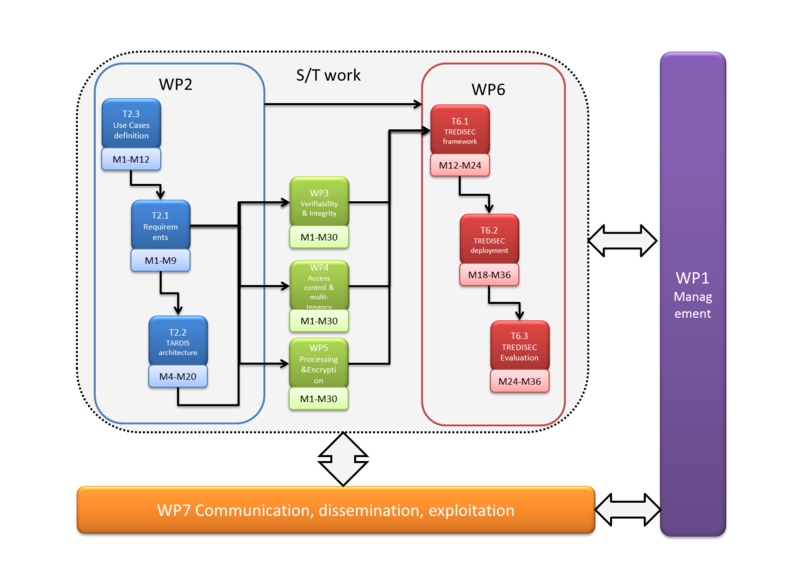 Finally, WP7 will coordinate communication, exploitation and dissemination activities. MS1: Use cases and scenario context definition due at M6. MS2: Consolidated requirements and architectural models due at M12. MS3: Design of the security primitives and framework due at M20. MS4: Implementation of the security primitives and the framework due at M30. MS5: Deployment of the Use Cases Evaluation environment due at M33. MS6: Final evaluation of TREDISEC due at M36.